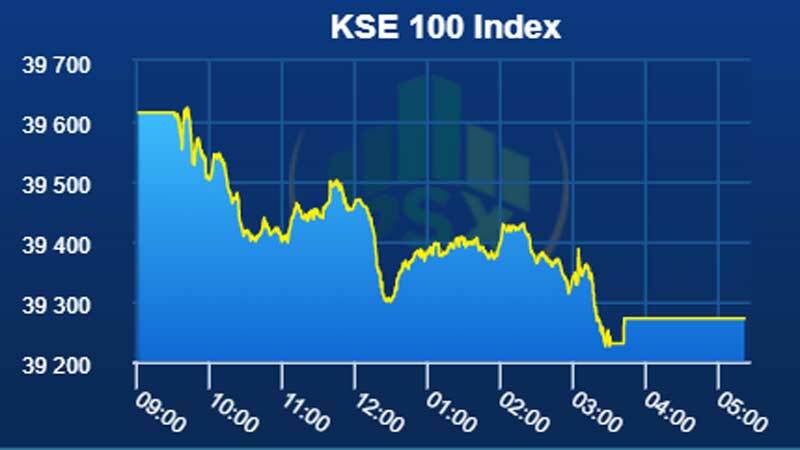 Pakistan’s equities Wednesday closed on a negative note with benchmark KSE-100 Index losing 342 points, to finally settle at 39,272 levels, down 0.9 percent. The market started off on a weak note only to continue the downward trajectory amid low volumes and lack of participation. KSE-100 Index remained lackluster throughout the session due to lack of investors’ interest as they wait for upcoming ‘Mini Budget’ scheduled to be presented in the National Assembly on 23rd January. An equity analyst at Trust Securities said KSE-100 index continued with the downward trend until the market closed in the negative zone losing significant points during the day. Investors tracked down developments as a report released by the International Institute for Finance (IIF) said Pakistan’s government debt rose to 71.2 percent of gross domestic product (GDP) or 3.9 percentage points in the third quarter of 2018 from 67.1 percent in the same quarter of 2017. Top volume leaders were K-Electric losing 1.1 percent and Pak Elektron (PAEL) losing 2.3 percent with more than 20 million shares exchanging hands. Cement sector closed lower than its previous day close where big players lost value to close in the red zone. Lucky Cement losing 1.7 percent, DG Khan Cement (DGKC) losing 2.4 percent, Maple Leaf Cement (MLCF) losing 2.2 percent and Pioneer Cement (PIOC) losing 1.9 percent were the major losers of the mentioned sector. Profit booking was witnessed in the Exploration and Production (E&P) sector where Pakistan Petroleum Limited (PPL) losing 1.6 percent, Pakistan Oil Fields (POL) losing 1.9 percent and Oil Gas Development Company (OGDC) losing 0.9 percent were the major loser despite crude oil edged higher in the international market. An equity analyst Maaz Mulla recommends investors to track news flows with respect to the Mini Budget.